Unsustainable fishing has depleted coastal fisheries worldwide, threatening food security and cultural identity for many coastal and island communities, including in Hawai'i. 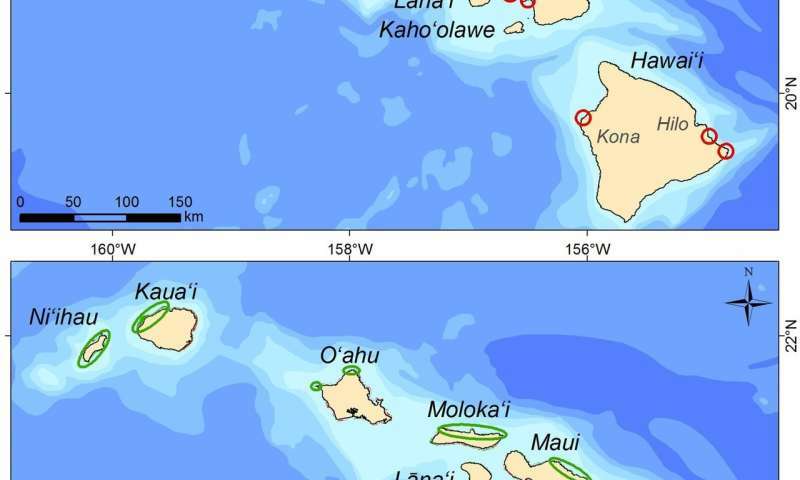 A recently published study, led by researchers at the University of Hawai'i at Mānoa, identified areas in the Hawaiian Islands that would provide the greatest increase in coastal fishery stocks, if effectively managed. Fishing is a way of life in Hawai'i. Coastal fisheries provide over two million pounds of fish per year in the Hawaiian islands and fishing is intimately linked to recreation, traditional knowledge and practices, and social cohesion. To determine where management and conservation efforts would be most impactful, researchers developed regional "seascape models" that integrate fishing patterns and reef fish survey data to produce maps of key habitats that support abundant coastal fishery stocks. In their computer model, the research team simulated the effect of removing fishing pressure. These detailed maps reveal areas with the highest recovery potential for reef fisheries on each island, providing important information for resource managers. "The results provide hope in terms of the scale of potential recovery in the areas we identified," said lead authors of the study Kostantinos Stamoulis, a UH Mānoa researcher at the time of this work, and Jade Delevaux, geospatial analyst at the UH Mānoa School of Ocean and Earth Science and Technology (SOEST). Fish stocks were predicted to increase by more than 500 percent on average for the identified areas on O'ahu, the most heavily fished island. Areas with the highest recovery potential for coastal fisheries across the island chain were located on east Kaua'i, southeast and southwest O'ahu, south and northwest Moloka'i, Ma'alaea bay and the west shore of west Maui, west Hawai'i Island just north of Makole'a point, and east Hawai'i Island around Cape Kumukahi and north of Kaloli point. While full recovery could take decades, protecting areas with the highest recovery potential would allow them to serve as sources of larvae and adults to replenish overfished areas. "Our study also identified remote areas with habitats that currently support healthy fish stocks, such as the north shore of Moloka'i and the south shore of Maui. Managing these areas would ensure that they continue to supplement coastal fisheries into the future," said the lead authors. Generally, areas located near rural parts of the north shores of all islands are not heavily fished, have high quality habitat, and therefore support abundant stocks of reef fish. The State of Hawai'i has committed to effectively manage 30 percent of Hawai'i's nearshore waters by 2030. To meet this ambitious goal, the Division of Aquatic Resources is leading a statewide analysis of existing science in partnership with The Nature Conservancy to identify areas for effective marine management. 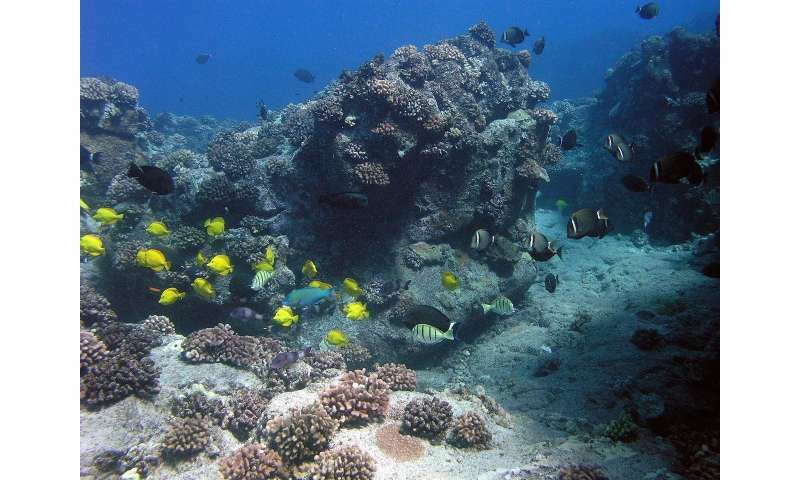 "This new study will help us identify those areas with the greatest potential for increasing reef fish populations on all islands," said Bruce Anderson, administrator for the Department of Land and Natural Resources Division of Aquatic Resources. "This scientific information will be compared with an ongoing spatial analysis as part of the Marine 30x30 Initiative. Ultimately our intention is to combine this information with local knowledge and collaboratively identify what to do in management focus areas." Concludes Alan Friedlander, chief scientist for National Geographic's Pristine Seas program and a co-author of the paper, "To ensure food security and overall ecosystem sustainability into the future, we must significantly increase the amount of area protected from overfishing and other human impacts. Our study provides an ecosystem-based approach that helps to identify areas that will benefit the most from increased management in Hawai'i and elsewhere."